In order for a crop to be successful farmers need the weather conditions to be right. Farmers invest in seeds and if it doesn’t rain they can lose their investment and be left without the money to buy more seeds. Pula’s project provides farmers with Germination Insurance, included with each seed purchase. The system we created allows farmers to register for the insurance, using their phone, after they buy the seeds. Then if there’s no rain they’re able to get another bag of seeds. 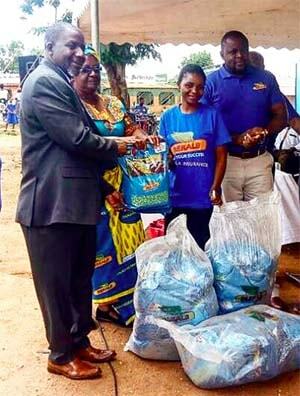 Pula are currently holding events in Malawi and Zambia to promote the insurance to new farmers and provide compensation to farmers who have registered already. The events are promoted by TV and radio and on average 250+ farmers attend. The events allow farmers and seed companies to see the process work, and farmers are getting the help they need. 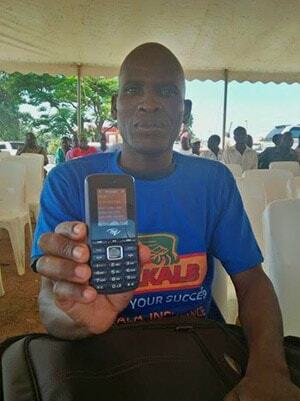 Harry Misomali, Reimbursed 2 x 5kg, Shows his SMS. Each SMS has a unique PIN, which can be redeemed at ANY shop in Malawi or Zambia. The shop-owner redeems the PIN and the bags are credited to the shop account within 14 days. This is a no cash transaction. The Germination Insurance service will continue for the rest of the growing season in Milawi and Zambia. Pula plan to make it available to farmers across Africa.